I'm not in Barcelona this week. I stopped going to MWC a few years ago, when the hassle and costs involved started outweighing the benefits. One year I had 400 requests for meetings, and it took me a solid 2 weeks of email just to sort my diary. No more - I prefer smaller events, which have the added benefit of fewer "messages" being hammered into my skull by stressed marketing execs and their PR/AR minders. But I am watching from afar, scanning Twitter and a few webcasts for nuggets of insight, from the comfort of my sofa, bed or local artisan coffee place. Nokia's reinvention continues. On its analyst/press webcast yesterday, it made a big deal about verticals and enterprise-related activities too. Utilities, transport, public sector and "webscale" companies were namechecked, including (again) private cellular either standalone or in partnership with classical MNOs. It also highlighted optical and IP networks (which came with the ALU acquisition) which was an interesting choice for a mobile event. Props to CEO Rajeev Suri for using "Webscale" instead of the pejorative "OTT": much more mature and inclusive language. There's an awful of of 5G-washing going on, unsurprisingly, with plenty of references to its supposedly world-changing abilities. Governments and policymakers have all swallowed the 5G spin, without realising it's mostly just a pitch for more spectrum. Yet the GSMA head Mats Granryd talked in his keynote about 1.1 billion users in 2025. Given half of those (or more) are likely to be smartphones, that suggests that maybe 500m, at most, will be 5G IoT devices. Which, depending on your preferred overhyped forecast number, implies about 1-4% of the total IoT universe in 2025 - hardly the most indispensable enabler of the overall automated society of the future, nor an indicator that a spectrum monoculture policy is desirable. Doesn't suggest billions in new value from network-slicing capabilities, either. In a nutshell, 5G is important, but it's not the gamechanger many assert. Use the hashtag #5Gwash to call people out on it. The most-discussed new handset is HMD Global's new take on the classic Nokia 3310. As well as its retro looks, it sports a month-long battery, the Snake game, and a whole two (count 'em!) generations of cellular technology. That's right, it's a good-ole 2G GSM, calls+SMS device. Plus, it comes in a dual-SIM version. That's proper plastic SIMs, naturally, not this newfangled eSIM stuff. Sounds like a great backup device for 2-factor authentication when your main phone breaks or gets stolen. GSMA published an eBook on "Messaging as a Platform" (link), tying its MaaP vision to RCS. There's a lot of generic stuff about chatbots, AI and "conversational commerce" in there, without explaining how it relates to a useless messaging service which isn't even a successful product, nor has any form of unifed API. Unless, as I suspect, it's aimed at making MNOs the distribution channel for Google's chat interface, Assistant and voice-recognition tools. Maybe there's a Google API / PaaS play to look forward to? As I wrote last week, operators should ignore RCS and So-Called Advanced Messaging (yes, I like the acronym) and do more-relevant things instead. The same applies to contact-centre and multi-channel vendors: there are plenty of more-urgent things to look at. 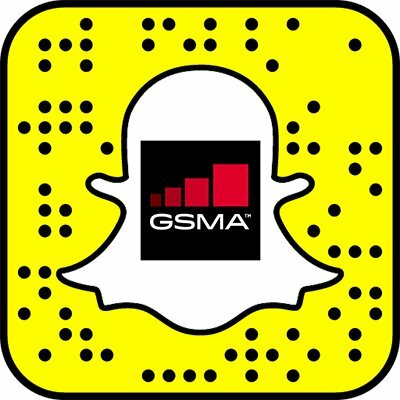 The GSMA's continued use of a Twitter SnapChat avatar points to the fact that platform status is earned not just imposed. The "official" announcement that Deutsche Telekom's immmr VoIP/messaging spin-off is using GenBand's Kandy cPaaS is interesting (link), although it was talked about informally last year at TADSummit (link). Looks like it's Internet/WebRTC-based and very much a good example of "post-IMS" mobile communications, with iOS and Android apps as well as browser access. No RCS nonsense visible, although I can imagine that DT's network-fundamentalist wing might have something to say about in future. More MWC de-spinning if I get a chance over the next couple of days. A Core Problem for Telcos: One Network, or Many? Is it better to have one integrated, centrally-managed and feature-rich network, or several less feature-rich ones, operated independently? Most of the telecoms "establishment" - operators, large vendors, billing/OSS suppliers, industry bodies - tends to prefer the first option. So we get notions of networks with differentiated QoS levels, embedding applications in-network with NFV and mobile edge computing (MEC) and perhaps "slicing" future 5G networks, with external customer groups or applications becoming virtual operators. There is an assumption that all the various standards are tightly coupled - radio, core network, so-called "telco cloud", IMS and so on. Everything is provided as a "network function" or "network service" in integrated fashion, and monetised by a single CSP. It's not just the old guard either. New "non-establishment" approaches to managing quality also appear, such as my colleague Martin Geddes' views on clever and deterministic contention-management mechanisms (link). That takes a fresh look at statistical multiplexing. Yet users, device vendors and cloud/Internet application providers often prefer a different approach. Using multiple network connections, either concurrently or being able to switch between them easily, is seen to help reduce costs, improve coverage and spread risks better. I've written before about using independent connections to create "Quasi-QoS" (link), especially in fixed networks with SD-WAN. In mobile, hundreds of millions of users have multi-SIM handsets, while (especially in IoT) we see multi-IMSI SIM cards that can be combined with roaming deals to give access to all mobile networks in a given country, or optimise for costs/performance in other ways. Google's Fi service famously combines multiple MVNO deals, as well as WiFi. Others are looking to blend LPWAN with cellular, or satellite and so on. The incremental cost of adding another connection (especially wireless) is getting ever lower. At the other end of the spectrum, data centres will often want redundant fibre connections from different providers, to offset the risk of a digger cutting a duct, as well as the ability to arbitrage on pricing or performance. I have spoken to "connected car" specialists who want their vehicles to have access not just to (multiple) cellular networks, but also satellite, WiFi in some locations - and also work OK in offline mode as well. Many software developers create apps which are "network aware", with connectivity preferences and fallbacks. We can expect future AI-based systems to be much smarter as well - perhaps your car will know that your regular route to work has 10 miles of poor 4G coverage, so it learns to pre-cache data, or uses a temporary secondary cellular link from a different provider. There are some middle grounds as well. Technologies such as MIMO in wireless networks give "managed multiplicity", using bouncing radio signals and multiple antennas. Plenty of operators offer 4G backups for fixed connections, or integrate WiFi into their same core infrastructure. The question then is whether the convergence occurs in the network, or perhaps just in the billing system. Is there a single point of control (or failure)? The problem for the industry is this: multi-network users want all the other features of the network (security, identity, applications etc) to work irrespective of their connection. Smartphone users want to be able to use WiFi wherever they are, and get access to the same cloud services - not just the ones delivered by their "official" network operator. They also want to be able to switch provider and keep access - the exact opposite of the type of "lock-in" that many in the telecoms industry would prefer. Google Fi does this, as it can act as an intermediary platform. That's also true for various international MVNO/MNO operators like Truphone. A similar problem occurs at an application level: can operators push customers to be loyal to a single network-resident service such as telephony, SMS or (cough) RCS? Or are alternative forces pushing customers to choose multiple different services, either functionally-identical or more distant substitutes? It's pretty clear that the low marginal cost of adding another VoIP or IM or social network cost outweighs the benefits of having one "service to rule them all", no matter how smart it is. In this case, it's not just redundancy and arbitrage, but the ability to choose fine-grained features and user-experience elements. In the past, the trump card for the mono-network approach has been QoS and guarantees. But ironically, the shift to mobile usage has reduced the potential here - operators cannot really guarantee QoS on wireless networks, as they are not in control of local interference, mobility or propagation risks. You couldn't imagine an SLA that guaranteed network connection quality, or application performance - just as long as it wasn't raining, or there wasn't a crowd of people outside your house. In other words, the overall balance is shifting towards multiplicity of networks. This tends to pain many engineers, as it means networks will (often) be less-deterministic as they are (effectively) inverse-multiplexed. Rather than one network being shared between many users/applications, we will see one user/device sharing many networks. While there will still be many use-cases for well-managed networks - even if users ultimately combine several of them - this means that future developments around NFV and network-slicing need to be realistic, rather than utopian. Your "slice" or QoS-managed network may only be used a % of them time, rather than exclusively. It's also likely that your "customer" will be an AI or smart application, rather than an end-user susceptible to being offered loyalty incentives. That has significant implications for pricing and value-chain - for example, meaning that aggregators and brokers will become much more important in future. My view is that there are various options open to operators to mitigate the risks. But they need to be realistic and assume that a good % of their customers will, inevitably, be "promiscuous". They need to think more about competing for a larger share of a user's/device's connectivity, and less about loading up each connection with lots of QoS machinery which adds cost rather than agility. Nobody will pay for QoS (or a dedicated slice) only 70% of the time. Some users will be happy with a mono-connection option. But those need to be identified and specifically-relevant solutions developed accordingly. Hoping that software-defined arbitrage and multi-connection devices simply disappear is wishful (and harmful) thinking. Machiavellian approaches to stopping multi-connection won't work either - forget about switching off WiFi remotely, or connecting to a different network than the one the user prefer. This is one of the megatrends and disruptions I often discuss in workshops with telco and vendor clients. 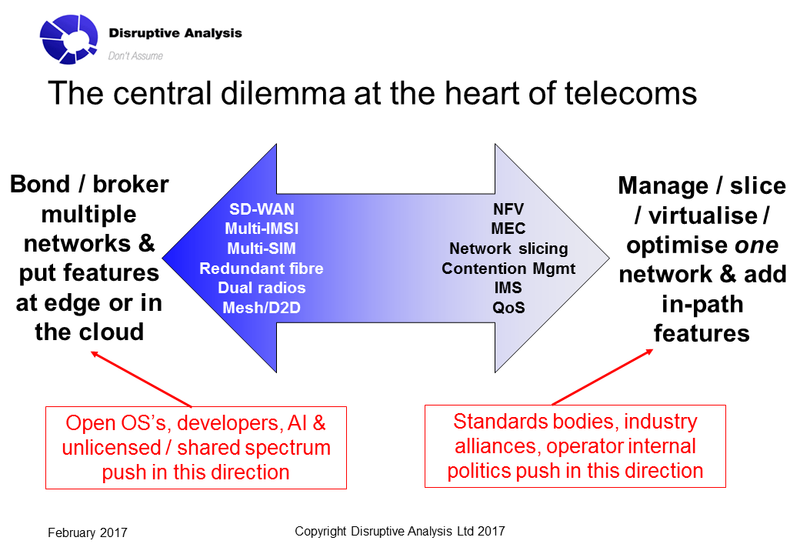 If you would like to arrange a private Telecoms Strategic Disruptions session or custom advisory project, please get in touch with me via information AT disruptive-analysis DOT com. There were about 150 attendees from a range of operators, broadcasters, government bodies, vendors, consultants, Internet and industrial players and internal Ofcom staff. There may be an audio/video recording of the sessions put up online at some point, but I'm not certain of this. My presentation was a very broad one - I was tasked with imagining how the future economy, consumer and business environment might look like in the year 2030, what disruptions and innovations may occur between now and then, and how that flows back into the use of wireless networks and therefore spectrum. In other words, I was wearing my "telcofuturist" hat, where I take generic futurist themes and apply them to the specifics of telecoms and the broader wireless industry. After my presentation, I joined Philip Marnick for a Q&A session with the audience, which was a mix of regulatory, futurist and general analyst-type discussion. The rest of the event was made up of a series of presentations and panel debates between a broad set of industry luminaries and innovators, including Dino Flore of 3GPP & Qualcomm, Simon Saunders of Google (& formerly the Femto Forum), plus others from O3B, Ericsson, Veniam, BT/EE, Vodafone, Silver Spring and others. There was a really interesting session on mesh networks later in the day, which I also think has a lot of potential. It was a really refreshing change from some of the usual sponsor-driven snorefests, although there was clearly a strong "lobbying" flavour to some of the questions, with people taking advantage of access to the regulator in an open forum. One thing that struck me about both this event, and another event I attended recently at Tech-UK's Spectrum Policy Forum (link) is a growing frustration in the regularory community. Some people now view spectrum purely as a "mobile" thing, without simultaneously mentioning broadcast, government, WiFi, LPWAN, industrial, satellite, fixed-access and all the other users of the airwaves. The mobile industry tends to be very good at pitching for more and more slices of spectrum, ideally provided on an exclusive basis with long licence terms (in exchange for quite a lot of cash in terms of fees, to be fair). It has a far bigger and more cohesive lobbying and publicity engine than the broad set of other spectrum stakeholders. My own view - and, it seems, many regulators' - is that given the finite amount of spectrum, there is ever less rationale for exclusivity. Various forms of sharing and private networks are rising up the agenda. My recent piece on Industrial IoT and sharing [link] has garnered a lot of good feedback, while the National Infrastructure Commission's Dec'16 report [link] recommended that "Government and Ofcom should review how unlicensed, lightly licensed spectrum, spectrum sharing and similar approaches can be utilised for higher frequencies to maximise access to the radio spectrum". In other words, spectrum-sharing - of various types - is moving up the regulatory agenda very fast in the UK. I think onsite industrial IoT coverage, via private cellular or licenced-band WiFi deployments, is the easiest to conceptualise and "sell", but there are plenty of other angles too. Whether the emphasis on mobile uses of spectrum, and the 3GPP/GSMA "national MNO" view of the world could lead to a "monoculture" of cellular connectivity. As in agriculture, the superficial efficiency/yield needs to be considered in the context of risks. Might there be long-term benefits in "network diversity", and should regulators look to protect it, the same way environmental rules protect biodiversity? On a similar environmental theme, I considered habitats that are primarily "mono-platform" and fragile to external events (eg coral reefs) vs. "multi-platform" ecosystems which are more resilient (eg rainforests). Obviously this doesn't translate precisely to wireless networks, but the metaphor seems apt. I'm not a biologist, but a quick word with someone who does study ecosystems afterwards suggested my analogy is worth further exploration. 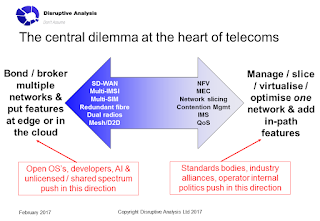 "Arbitrage Everywhere": future networks - and by extension both spectrum and telecom competition rules - should anticipate devices and applications using multiple connections / service providers, and picking and choosing/bonding connectivity from several options. This is already seen in the fixed world for enterprise with SD-WAN, and should be expected in wireless too. This means that "partial competition" (eg from WiFi, LPWAN, satellite, private cellular) should be considered as well as like-for-like rival infrastructure from other national MNOs. Redefining the nature of a "service" - what do we actually mean, when we frame our regulation of "service providers"? Many more organisations are offering connectivity services, while many other models of delivering a "capability" are emerging. WiFi can be a service, owned by a venue, given away for free, provided as an amenity, self-provisioned by a user and so forth. ITU's definition of a service ("a set of functions offered to a user by an organisation") seems to be too narrow given the rise of developers, embedded connectivity in IoT, private networks and more. I discussed the relative timing of various industry trends - and the fact that various look like swinging "pendulums". For instance we see a back-and-forth between centralised vs. distributed control, standards vs. proprietary technologies, local vs. national vs. global and so on. I noted that the timing of the various pendulums' swings are not all in sync - and therefore the actual outcome for the wireless sector is really complex to predict. Various external trends (eg open source, Moore's Law, AI, geopolitics, specific companies) can act as weights on the pendulums. I noted that many different and new organisations may own/operate/embed wireless connectivity in future. Aircraft engine manufacturers use satellite telemetry and download sensor data via WiFi to optimise their analytics for selling "power by the hour". IoT platforms & MVNOs for specific sectors are springing up (eg Cubic Telecom for automotive). Theoretically, Elon Musk could use SpaceX to launch his own satellites - and provide vertically-integrated connectivity to Tesla cars. Google has numerous wireless initiatives, from Fi to WiFi to white spaces to its Loon balloon project. The Governor of California has suggested launching the state's own earth-sensing satellites, if the current administration cuts federal funding for environmental monitoring. Then there are public-safety LTE networks, WiFi everywhere, new mesh concepts, private LoRa deployments and so on. In the Q&A, I also discussed 5G bands, NFV, network-slicing and more. I noted that 5G is being driven initially by fixed-access and 28GHz in the US & S Korea, not the three "mainstream" uses of critical IoT, ultra-mobile broadband and massive IoT. This is outside the "official" bands being pushed by Ofcom as "pioneer" options, and slowly being explored internationally for the ITU WRC event in 3 years' time. This was explored in another post of mine (link). I also expressed doubts that NFV-led network-slicing will deliver all the agility required for creating vertical-specific networks - even if it allows "super-MVNOs", will the host network provide enough fine-grained control and liability-bearing SLAs? Overall, my session seemed to be very well-received. Hopefully I've prodded some parts of the industry. I'd like to see a wider recognition of the changes to some of our fundamental assumptions that will occur over the next decade and beyond. A key point is that 5G, delivered by traditional MNOs as a subscription service, is exciting and important - but it must not be allowed to totally dominate discussions around spectrum. Governments and regulators must push for "network diversity" of technologies, stakeholders and business/operational models - including private networks for businesses. Short-term focus on "efficiency" of a monoculture approach may mask wider ecosystem-level risks. A key theme is the need for flexibility and agility in wireless networks and related regulation - many of the more radical changes will occur at timespans of 1-5 years, which is much shorter than the investment and planning horizon for a lot of the industry. Whether we need more malleable licences, better secondary marketplaces for spectrum, new forms of sharing (eg using blockchain as a basis for a distributed database of allocations), or a rethink on how competition is measured, there are plenty of options. Spectrum policy is several steps away from the actual world of consumer and business needs for wireless networks. But it's for that reason it's worth thinking deeply, about the long chain of implications of seemingly small decisions or baked-in business models that are created now. Telcos & OEMS: You should ignore the GSMA's "Advanced Messaging", RCS & "Universal Profile"
Summary: There are 10+ reasons why RCS messaging has failed, despite a decade of trying. Even with Google's involvement, the GSMA's "Universal Profile" and "Advanced Messaging" only fix, at most, two of these problems - and introduce new ones. Despite the hype, mobile operators should continue to deploy VoLTE only when it is really needed, and should avoid Advanced Messaging, RCS and ViLTE entirely. There are many other better ways for telcos to retain relevance in communications apps & services. In the next couple of weeks, we will likely be hearing a lot about the GSMA’s “Universal Profile” (UP), developed with Google as a standardised setup for new Android devices to support VoLTE, plus the latest version of the decade-old failed RCS messaging "zombie" service, now being rebranded as “Advanced Messaging”. UP also incorporates a version of ViLTE, the video-calling application that can’t even be called a zombie, as it was never alive in the first place. Essentially, UP is a combination of VoLTE and RCS6.0. The first spec was published in Nov 16 (link). (Microsoft is also apparently supporting it, although seems less deeply involved than Google). Expect the MWC announcements to talk breathlessly about how this is going to enable “Messaging as a Platform” (MaaP), and there will likely be some dubious-seeming big numbers mentioned. Any claims of "XXXmillion active users" should be *very* carefully questioned and analysed - what actually counts as use? There will be a lot of spin, painting what is essentially legacy SMS usage with a new app, as RCS. Daily is much more relevant than monthly data here. Most probably, you’ll hear lots of hype and PR noise about “mobile operators winning back against the OTTs”, or “people won’t need to download apps”, or “everyone is fed up of having 17 messaging apps”. You’ll hear that it can use network—based QoS, which is great for VoLTE primary-telephony calls, but irrelevant otherwise. Vendors will probably say “well you’ve got an IMS for VoLTE so you should sweat the assets and add extra applications”. We might even get an announcement about “advanced calling”, which is a way to improve phone calls with pre/mid/post-call capabilities (not actually a bad idea if done well) but force-fitted to use RCS rather than a more pragmatic and flexible approach (which is a very bad idea, and likely executed very poorly). So ignore it. There are no customers, no use-cases, and no revenues associated with “advanced messaging”. It’s the same pointless RCS zombie-tech I’ve been accurately predicting would fail for the last decade. It’s still dead, still shambling around and still trying to eat your brain. It’s managed to bite Google and Samsung, and they’ll probably try to infect you as well. If you're new here: I've been following and talking negatively about RCS for 9 years now. The project started in 2007, and emerged as a lukewarm 2008 IM concept for featurephones (link) in the days when both iOS and Facebook where just emerging onto the stage. I described it as a "coalition of the losers" in a report in 2010 (link) It evolved to a dead-on-arrival branded app called "joyn" as smartphones gained traction (link), and it has tried climbing out of its grave so many times since that I describe it as a zombie (link). Various operators have deployed it, then given up - even in markets like Spain and South Korea where multiple operators offered it at first. I'm currently writing a report on VoLTE trends and implications for my STL/Telco 2.0 Future of the Network research stream (link). It should be out in the next month or so. As part of my research, I've been updating myself about the GSMA's plans to blend VoLTE with RCS - hence becoming aware of the Universal Profile and Advanced Messaging developments. Most people I speak to in the mobile industry privately admit that it's been a huge white elephant. I've met people who've been given the "poison chalice" of RCS inside operators and eventually quit their jobs in desperation. Huge slugs of time and money have been spent on a no-hope service, that could have been better deployed elsewhere, on things that could make a real difference. A few operators misunderstanding the nature of user behaviour, requirements and preferences for communications services, thinking that there had to be a standardised and interoperable "magic bullet" to compete with WhatsApp, Facebook, iMessage and WeChat (and 100's of others). The desperation of network vendors trying to make IMS seem relevant for something other than plain-old phone-call VoIP, either for fixed broadband voice, or VoLTE. The GSMA's stubborn belief that it needs to predefine interoperability and lengthy specifications, rather than iterate on something basic that people actually like. Also, the belief that it has to tie in the phone number / any-to-any model. Google, wanting to find a way to compete in the messaging space it has repeatedly failed with, especially creating an Android version of iMessage based on the Jibe acquisition. Samsung has recently joined in with its own acquisition of Newnet. So my "coalition of the losers" joke (er... jibe?) in fact has a reasonable basis in history. And history doesn't record many such coalitions having great success at anything, except maybe keeping a few people occupied. A couple of operators have launched recently - Rogers and Sprint in North America - but the other operators are still delaying, and have big iPhone populations anyway. In the meantime, while the telecom industry has procrastinated over RCS, various other adjacent players such as Twilio and Nexmo (now Vonage) have pushed the supposedly "dead" SMS market to become the standard mechanism for A2P messaging, and signed up thousands of developers for that, plus voice/video/notification cPaaS capabilities. In the time it has taken RCS to get to its 10th anniversary, we have seen Apple, Facebook, Whatsapp, WeChat and others create huge value and loyalty. It’s a little difficult to tell if Google actually believes in RCS, or whether it’s just cynically using the GSMA and gullible MNOs to push Android harder – and especially, help reduce the horrendous fragmentation of its platform in terms of both OEM-specific skews and non-updated older OS variants. As I wrote previously (link), it also seems likely that Google is using the surprisingly-pliant cellular industry to help it create its own version of Apple’s iMessage. The optional hosted RCS Hub could also be an early foray by Google into the NFV and cloud communications space – perhaps with an eye to ultimately competing not just with the Huawei/Ericsson/Nokia axis, but also maybe Amazon and Twilio over time. That’s quite an extrapolation on my part, though - not based on anything public from Mountain View. What’s definitely clear is that Google doesn’t see RCS as “the one messaging platform to rule them all”, nor the Universal Profile as a way to replace all other forms of voice and video communications. It has a broad range of other services, including Duo, Allo, Voice, HangOuts (now being reoriented towards enterprise), WebRTC support in Chrome and perhaps natively in Android at some point. It also has a stake in Symphony (messaging/UC for finance and other verticals), and works with most of the larger UCaaS and hosted PBX/UC players. It also wouldn’t be a surprise if Google acquires other cool youth-oriented messaging apps to compete with Facebook’s Instagram, although a post-IPO Snap might be too pricey. And of course, it has its own push-notification platform which is probably (quietly) the world’s biggest messaging service that nobody talks about. In other words, Google seems OK about creating a lowest-common denominator function that's no worse than what it has already, but which brings extra cooperation brownie-points from the mobile industry, and a bit more leverage with its wayward licensees. Its downside is limited - and if miraculously it somehow it can create a MaaP platform, its upside significant. There's probably also some interesting data-analytics and machine-learning gains in here somewhere too - even if it's just a better understanding of what Android users don't like. In other words, from Google's point of view, it's a worthwhile and almost risk-free punt. Whether the mobile industry wants to over-rely on a company with a reputation for ruthlessly shutting down failed ventures is another matter. What's wrong with UP/Advanced Messaging? Where do I start?! Well, perhaps by pointing out what actually has changed for the positive. It's true that Google is offering a hosted RCS platform for operators that don't yet have an IMS. ("Effectively sponsoring this piece" - link). That's helpful as it reduces friction and cost of operators getting RCS to market. So to does having a pre-certified set of devices that should work with that platform, or in-house deployments. But while perhaps those are necessary, they are very far from being sufficient. Many other problems and concerns abound. The biggest lie about RCS and the “universal profile” is that it will become universal or ubiquitous. Not only is Apple not likely to support it, but it is far from clear that Android OEMs will implement it on all their devices, especially those sold in the open market. It is unlikely to have good PC support (although to be fair, neither does Whatsapp). It is unlikely to be downloaded onto older Android phones. It is unlikely to work smoothly on dual/multi-SIM handsets, of which there are hundreds of millions. It’s unlikely to work well on many MVNOs’ devices (neither does VoLTE). It’s also unlikely to work nicely on the vast plethora of smart IoT devices that support SMS – even those with decent web-browsers and app downloads. I've seen some of the projections for RCS-capable handset penetration, and I think they're significantly over-enthusiastic, especially if considered on a country-by-country basis. There is no relevance of RCS for the enterprise UCaaS and vertical markets that telcos urgently need to focus on. That has to integrate with all manner of other communications services that seem unlikely to have more than a loose coupling with RCS, if at all. It won't be replacing email, Office365, Cisco Spark, Slack, HipChat and numerous other collaboration tools, not to mention the universe of video-conferencing. It's also going to be a long time before it becomes another channel in contact centres' multi-channel platforms - there's a long list of bigger fish, especially if WhatsApp and Facebook offer APIs to billions of users. The MaaP approach seems doomed to failure – there are no examples of successful technology platforms that have not been based on successful technology products first. Trying to pre-guess the requirements for a platform – let alone creating voluminous standards for it - ignores a wealth of experience: customers use products in unexpected ways, with spikes in viral adoption, unpredictable demographic biases, emergent behaviour and geographical patchiness. Platforms are created in response to a product’s growth, not pre-ordained. Nobody predicted that Snapchat had the potential to become a media channel and camera/AR platform – those angles represent reactions to actual real-world usage, as well as improvements in “adjacent” technology in the interim. More importantly, developers are unlikely to become interested until there is evidence of real-world usage among a decent slice of their target audiences. You'd have to be a brave airline to ditch your native apps, ignore Facebook and WeChat and iMessage, and port your main loyalty "experience" to a mini-app inside the RCS client. There are assorted other problems lurking as well - interconnect and roaming should be interesting. Will it really be free to do video-sharing and file-transfer to your friend in Singapore? Trying to work out the pricing aspects will be challenging too - unless everything is free, for everyone, and to everyone. While that might be feasible for post-paid customers with big data quotas, it's unlikely to translate to the worlds billions of prepay users. It's slow to evolve, as it's designed by committee. It's not set up to do A/B testing on live audiences - maybe 100 million on a redesign first, to see how it goes and then make a call on full rollout. Standardisation and interoperability doesn't work with the agile, devops approach to apps that is de-rigeur here. And another of the herd of elephants - what's it for? Who is going to use it, and why? I can't foresee any case-studies of teenagers saying "I used to SnapChat my friends all the time, but now we only use HyperMessage+ from NetworkXYZ!". Is it just generic SMS-style "Hi, I'm running 5mins late" stuff? But with "rich" elements, at least insofar as the person you're connecting with is another RCS user who can see them? Why else are people going to use it, except maybe as some sort of lower-than-lowest common denominator? And moreover, whats going to keep them using it, given how dynamic the communications app market is. Unless it can capture the "cool" factor, it's toast. This is the problem - pretty much everyone can get WhatsApp or WeChat or Facebook. There's a 90%+ chance your friends are on your platform of choice and have no reason to switch. iMessage is the obvious anomaly, but it's more of a hygiene factor between Apple users - who often also have multiple devices like tablets and Macs as well, and who expect to "fall back" to FB or WA for friends (or groups of friends) who aren't Apple users. I guess in low-Apple penetration countries there could be tighter communities of Android buddies, but they may well include people with a lot of prepay accounts, older open-market handsets (some multi-SIM) and little likelihood to upgrade to a new UP-powered one soon. (One possible exception is India, given Reliance Jio's influence). If you’re the head of advanced communications at an operator, or looking into future voice and video services, don’t bother wasting your time in Barcelona on RCS or "advanced messaging". Sure, speak to vendors and look at cheap ways to implement VoLTE. The industry painted itself into a corner with a horrendously complex and expensive approach, so finding quick/simple/reliable ways to launch or scale it make sense. (Think open-source, cloud-based, pseudo-NFV for IMS without the hugely complex MANOs etc). VoLTE is becoming increasingly mainstream, although its adoption in many operators' networks is quite gradual. Insofar as the Universal Profile helps with handset/network interop for voice calls, it has a role to play. But beyond VoLTE, operators and handset OEMs need to ignore the exhortations of the GSMA to implement so-called “Advanced Messaging” (I wrote that before I realised the acronym spells SCAM). It will soak up money, technical and marketing resources, customer attention and credibility. Even if the Google-hosted RCS platform reduces the cost of operators deploying their own servers, it will still need testing, integration with in-house IMS platforms and new NFV systems and other actions. Be very very skeptical of all the announcements. Any user statistics should be scrutinised carefully - while some operators technically have RCS servers live, the key statistic that won’t be mentioned is how many active users are doing anything beyond basic SMS-type messaging. How many are actually using RCS properly - and like it? The reality is that essentially zero people have switched from using Facebook Messenger, WeChat or Snapchat to using RCS for any meaningful purposes – and a reasonable forecast for 2019 would be roughly zero as well. Go and see genuine innovators in messaging and communications platforms for inspiration. Have a look at the various business UCaaS providers. Seek out anything based on WebRTC. Speak to the cPaaS providers & talk about partnerships. Look for open-source platforms for infrastructure and IMS (eg from Metaswitch & Canonical). Track down in-app messaging, or ways to hook IoT devices' signalling traffic into the mix (MQTT and so on). Look for companies doing interesting things with SMS - it's not dead, especially for A2P uses. Look at what some vendors are operators are doing with 2nd/3rd-generation API platforms for developers. There are dozens of clever options for messaging innovation available for operators (or MVNOs, cPaaS providers, UCaaS players and other types of SPs). RCS is not one of them. It's notable that in all of the GSMA's literature & commentary I've been able to find, I've seen almost zero mentions of these words: Viral, Fun, Snapchat, Slack, Instagram, Emoji, Twilio. But there's lots of "interoperable" and "rich" and scare-stories about telephony ARPU. 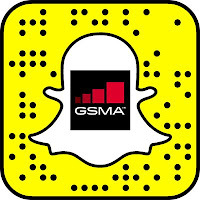 Although, ironically, GSMA's own Twitter avatar is a SnapChat ghost at the moment. And it has its own Snap channel (link). Maybe if it announces at MWC that SnapChat is transitioning to/interconnecting with RCS it'd be a gamechanger. But otherwise, it speaks volumes that it's promoting one of the Internet success stories in 2017 messaging. As I've said before: Ubiquity is earned, not imposed. RCS stilll needs to prove that users actually want it before it can have pretensions to being a platform. For now, remember So-Called Advanced Messaging is still a failure - it's an unfortunate acronym, but amusingly appropriate. If the Universal Profile had just been about implementing - and improving - VoLTE to improve the telephony experience, it would make sense. Instead, it's been weighed down with a lot of harmful baggage.